You can choose to renew/create a new subscription at any time by clicking on "Rates" at the top of the page or by clicking on "My account" if you are logged in with your username. If you are not logged in, creating your account can be done at the same time that you make your subscription. We offer various payment methods such as secure payment by credit card, Paypal, bank transfer, by check (France only), and also by Audiotel services. If you pay by credit card, PayPal or Audiotel services, your subscription will be instantly extended. It will be deferred if paying by Check or Bank Transfer. You can get registered by clicking on the "Sign Up" button at the top right of the site. Registration is free and there are no commitments. How to talk to another player? You can talk to all the players who are in the community (except during the 7-day trial period), unless they have indicated in their gaming preferences that they do not want to talk. So you can "chat" live on the game interface or send messages by e-mail via the website. The chat box is placed to the right side of the chess board. After selecting the player with whom you want to talk from the list of players, you can type a message and hit the "Enter" key. When your friends are online, they are automatically added to the list of players that you can talk to. Also your opponent will be added if you are playing a game. In this list of players, when you observe a game, you'll notice that you can talk to them at "@game." This is a shortcut to send a message to all the observers of the game. Can I have multiple accounts with the same subscription? Yes. You can create sub accounts by linking them to your main account. Each sub-account works as a real account and has its own preferences and statistics. The sub accounts have their limits where the main one is not being able to simultaneously connect with multiple sub-accounts. How to find an opponent to play? At the start of our game interface, the chessboard is blank and the game does not start automatically. So if you want to move the pieces, they remain frozen. To find an opponent, you must either send a proposal to play to a player or accept one from a player. In the game interface, the proposals to play are commonly called “challenges”. You can send/accept proposals of play in the area at the left of the chessboard or ask the server to automatically find an opponent corresponding to the defined game settings. - Besides your rankings, your games, statistics and other content will not be retained. It is possible to change accounts within a reasonable limit (1 or 2 times a year) or if it seems justified. A player is using inappropriate language. What should I do? You can immediately add the player to your blacklist. Such a list can be managed in the "Live gameplay" section of the site, or directly in the gaming interface. So this player will not be able to bother you. * Press the “Print Screen” key on your key board. * Then go to “Start”, “All programs”, “Accessories”, “Paint”. * Once the "Paint" program is open, go to "Edit" and "Paste". * You should see the picture of the screenshot you captured. Note: if the player is shown to be unpleasant because of bad remarks made by you or following your provocations, you may also be penalized. What actions will be taken following the reported cases? - the syntax of the entered email is incorrect. In this case please contact us by specifying the relevant username and the correct e-mail address. We will do the correction and we will send you your password. - your anti-spam system requests us a manual validation from the sender (an email was sent to us asking us to visit a site in order to confirm the dispatch of the email): use another email address. Welcome emails are automatic, and we cannot respond to these requests. Do not hesitate to contact us in special scenarios, we will find a solution. To castle, move the king two squares to the right for kingside castling and 2 squares to the left for queenside castling. - neither the king nor the rook should have left their original position. I suspect that a player is cheating. What should I do? - to lose games intentionally or accepting multiple wins from a player who loses games voluntarily. You can immediately add the player to your blacklist. Such a list can be managed in the "Live Game" site, or directly in the game interface. So that player can no longer annoy you. If you see or suspect a player to break these rules, you can submit this game which is considered to be suspicious for verification within 24 hours. At the end of a game, on the right side of the interface, you will see the appearance of an exclamation mark. Click on it and select "Cheat". A window pops up allowing you to choose the game in question, and then to validate your request, which will trigger verification. After the analysis of an administrator, if cheating is proven, the result of the game will be amended, Elo points will be recalculated and sanctions will be applied. If the game was played in a tournament, the tournament will be accordingly recalculated. The dishonest player will receive a regulations reminder and will be informed of the applied sanctions. His opponents will also be informed that an action has been taken on one of their games. In any case, the complainants will be informed of the actions taken on their report. - If this is the first time, players will receive a warning that will be kept on their file. - In case of recurrence, players will receive a final warning before account suspension. - In the third warning, the account will be suspended. How the points are calculated after a game? ELO rating for online games is not calculated in the same way as the official ratings. Here, the system used is called the Glicko system. It considers the rating volatility by calculating a RD parameter (rating deviation or standard deviation). The bigger the RD parameter is the bigger the number of points won/lost will be. When the players start with a new rating, they are given a rating of 1720 points and a RD of 350. Their rating will therefore adjust to their actual level due to large variations of points. After each game, the RD parameter as well as the number of points won/lost decrease. Just after 5 games, the RD parameter has lost half of its value. Above 100 games, it will vary only a little. When you do not play for a long time, the RD parameter goes up in order to readjust its rating. You can request to send your password on this page. For obvious security reasons, your password will be sent only to the e-mail address that is entered during the sign up. If you think you have entered a wrong e-mail address during the sign up or for any other special cases, contact us. What are the rules of calculating points if disconnected? - If the players reconnect within 20 seconds, they can return to the game and continue playing it. - If the player who goes offline has a material advantage of at least 3 pawns (or a piece) the game shall be counted as a defeat for him, but no Elo points are removed from him. However, his opponent will normally earn the Elo points. It is helpful to clearly define the type of problem that you are having. Is it a display problem? Does the game screen appear? Or does the display remain blank? Is it a connection problem? Note the error message that appears. 2. Check the rules of your firewall (Refer to the documentation for your firewall software). The connection should be allowed to outbound ports 443 and 843. * Login banned: Your account is suspended. Contact an administrator to find out the reason. * Your IP address is banned from connection: due to an abuse and whatever it is, your username and your connections is banned. Contact an administrator to find out the reason. * Too many active connections under your IP address: Too many connections are being used under your IP address. Can the disconnection be caused by your servers? We have a 24/7 monitoring service of our servers, including the quality of the network connection. In rare cases (Less than 20 cases per year) the server can be down due to a crash down of the server or a scheduled maintenance. Generally, it is due to maintenance and the disconnection does not occur suddenly. A message appears in the game interface alerting you of the closing down of the connection for a certain period of time. Furthermore, we analyze the disconnection cases that are reported to us and do the necessary research to rule out any problems of the server. What should I do if I am facing disconnection problems? Unlike browsing websites or watching videos, playing online games require a persistent and a perfectly uninterrupted connection. For an optimal connection, choose the network cable connection. USB or Wi-Fi connections are indeed considered less stable. However if you have no choice but to sign in to a Wi-Fi network, here are some explanations and advice. Wi-Fi connections are quite difficult to maintain due to the low transmission power. The quality of the Wi-Fi signal is highly dependent on factors such as the material used (transmission/reception antenna) or the obstacles between the antennas (metal parts). - Place the Wi-Fi antenna about 30 cm away from the wall. - The signal must be at least "Good" or "Very Good" or "Excellent". Otherwise, the signal will be too weak and the interruptions may occur. - The quality of your ADSL filters is important (brand filters). Also verify that there is an ADSL filter in all the sockets to which a telephone is connected. If the problems persist, perhaps it will be wise to contact your service provider to verify your connection line/ your ADSL device (Box or router). You can request your service provider to measure the actual capacity of your ADSL line. If they tell you that the actual data connection speed is less than what you have subscribed for, you can ask to go for a lower speed and the quality of your connection can be improved. How to enter in to a tournament? On theleft panel of the application, there's “Tournaments” tab with a list of tournaments: upcoming, ongoing, my recent tournaments. Upcoming: scheduled tournaments, but not yet open for registration. Ongoing: offers tournaments that are open for registration, ongoing tournaments and recently completed tournaments. Open for registration: to register simply click on the tournament of your choice, then on "Save my entry" if the tournament suits you. This function is also available by clicking on "View". A message will confirm your entry. Ongoing: allows you to follow the games, results and rankings of a live tournament.. Completed: includes recently completed tournaments for consultation. My recent tournaments: keeps track of all your entries, results and rankings..
Can I cancel my entry into a tournament? As long as the tournament is open for registration you can always unsubscribe at any time. To unsubscribe, on the left panel of the interface, click on “Tournaments”, then on the tournament in which you are registered, and finally click on "Cancel my entry". If this phrase no longer appears, it means that it is too late to unsubscribe. This function is also available in the tournament profile. What happens if I leave a tournament in progress? When a round starts and your tournament game begins, you must be present on the game area . If you are not logged into the game area at that time, you will be declared absent and you will not be able to attend the rest of the tournament. If you are unable to continue the tournament, be fair play, think about the other players and inform them. For this, in the tournament profile, click on the action "Abandon tournament". Can we play other games during a tournament? Once signed up to a tournament you must wait until it is launched. In order not to wait unnecessarily in front of a static chessboard (or in case of an exemption during a round for example), it is possible to usually play other games on the game area before and even during a tournament. Before every round of a tournament you will see a warning message (see below image), which says your next game will start in 1 minute , with a countdown. This will thus give you time to finish any ongoing game. Please note! Tournament games have priority! If you are playing, when the tournament game starts, the current game will be automatically abandoned to your disadvantage. Do the games played in tournament mode affect my elo rating? Obviously, games played in tournament mode are considered for Elo rating in the same way as other games played on the game area. What happens if we are disconnected? If you are disconnected when you are not playing a game (between 2 rounds for example), the disconnection will not affect your participation in the tournament, as long as you're back at the time of your next game. If you are disconnected during a game, the same rules as for all other games played on the live game area will apply, that is to say you have 30 seconds to reconnect. Once this deadline has expired, you will be declared defeated. If you are subjected to frequent disconnections, email us via the support, and we will provide you some manipulation that can help you. Can I play the same tournament with several sub-accounts? It is possible to enter a tournament with your main account or with one of your sub-accounts, but not with both. How to create a tournament? To provide you with more freedom, you can create tournaments according to your own criteria. On the left panel of the interface, in the “Tournaments” tab, there’s a button named “Create a tournament” which pops up a panel as shown in the below image. In the first drop-down menu you define the type of tournament. A Swiss system will offer pairing between players with the same number of points. whereas a round-robin tournament will make all players play against all others. A "double" round-robin tournament will in fact be a double round-robin tournament where each player will meet all the others, once with the white pieces and once with the black pieces. You can also set an Elo range for participants. The game speed, with or without increments, for example 5 + 2 will give 5-minute games for each player with an addition of 2 seconds for each move. And finally, you can choose the order of the tiebreak system. Moreover, you can create private tournaments restricted to a list of usernames that you define, or public tournaments open to all players. Feel free to add a blurb that is visible to all in the tournament profile. What are the different tiebreak systems? To break the tie of players with equal points, you have a choice between several tiebreaker systems. You can define their order of consideration. What should I do if I suspect a player of cheating? If you see or suspect a player for violating the rules, you can submit the game that is deemed suspicious for verification within the next 24 hours. At the end of a game, on the right side of the interface, you will see an exclamation mark appear. Click on it and select "Cheating". A window pops up, allowing you to select the game in question, and then validate your request, which will thus trigger the verification. After it is analyzed by an administrator, if cheating is proven, the result of the game will be changed, Elo points will be recalculated and penalties will be applied. Meanwhile, the tournament will be recalculated accordingly. The dishonest player will receive a reminder of rules and regulations and will be informed of any penalties imposed. - If it is the first time, the player will receive a warning that will be kept on his/her record. - In case of recurrence, the player will receive a final warning before account suspension. - At the third reporting the account will be suspended. What are my responsibilities as a creator of a tournament? When you organize a tournament (accessible in the left panel, "Tournaments" tab, by clicking on one of the tournaments and then on "View"), you have a responsibility to address potential problems reported by other players. In the tournament profile, the action "Reported problems" records reports made by tournament participants. Moreover, whenever a new issue is reported, you will be notified in the notification area (at the bottom of the left panel). In case of cheating, you can review the game, download the game in "pgn" format to verify and if appropriate, disqualify the player, award the points of the game to the opposing player, and recalculate the scores of the tournament, if you feel that cheating is proven. What are the penalties for cheating? If after verifying the cheating is proven, the cheater will be disqualified from the tournament, the points of the game in question will be awarded to the opponent and the scores of the tournament will be recalculated. In addition, Elo points will be re-adjusted for the game in question, even after if the tournament is over. And finally, if the cheater is a repeat offender (at least 2 tournaments over a 1 month period), he/she will be banned from tournaments until further notice. However, it is up to the player to carefully think before attempting to cheat. We remind you that at the time of registration, the box indicating: "I agree to adhere to the guidelines", which very clearly states the formal prohibition of using an analysis module to play, has been checked. Failure to observe this part of the "contract" makes us totally respect our part of the contract, and paid access to the cheater’s game area is no longer guaranteed. I was dismissed from a tournament. What can I do to "redeem"? We place great importance to the behavior of the players on the game area. Honesty, fair play, respect for the opponent are not empty words. If you have done a mistake, you must contact us via the support and we will address such requests case by case. How to prevent some players from registering to one of my tournaments? When you organize a tournament, all the players that you have placed in yourc blacklist will not be able to register. What will happen if it is impossible to match a round? Sometimes, especially for Swiss system tournaments, a round is impossible to match, for example if too many players left the tournament. In this case, the tournament immediately ends without playing the next round. A final ranking will be performed under the same conditions as if the tournament had ended normally. What are the different types of tournament available? You can play Swiss system tournaments (starting from 6 players), or round-robin tournaments (single or double) starting from 4 players. What happens if a tournament do not have the required number of registrations? If a tournament does not reach the minimum number of players by the time it is ready to start, it is canceled. If you are registered for a tournament and that it is canceled, you will be notified in the notification area at the bottom of the left panel. Are there any prizes for tournaments organized ? For the moment, the tournament mode is available for a test period. We would initially collect maximum information, suggestions, constructive criticism, etc. that players can send us via the support before considering the possibility of organizing tournaments with prizes. We are open to suggestions on this, and please write to us via the support. How to differentiate tournaments organized by ChessAnyTime from other tournaments? 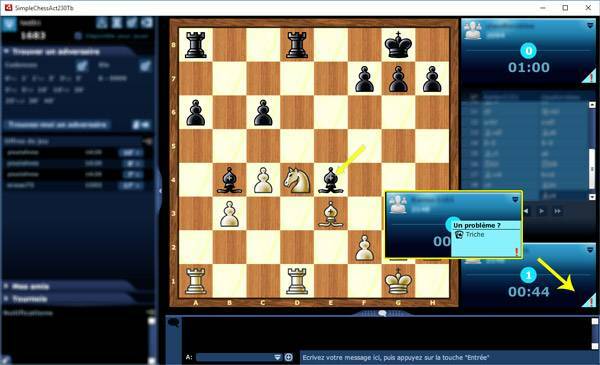 When tournaments are organized by ChessAnyTime, the tournament organizer is identified by “TournamentBot”. In all other cases it is the username of the player that organizes the tournament that is mentioned instead. How can I download my tournament games? On the website, under the“Live games” section, in the menu at the top of the page, click on “Tournaments”. Then, click on “ My archived tournaments ”, then click on the tournament to display its record. From here you can download or view one or all of the games. Puzzle: is an exercise to be solved using 1 or more moves. Series: is a consolidation of several exercises (often 10) completed one after the other, at the end of which a total score is calculated. What is the benefit of practicing to solve tactics exercises? Tactics exercises work your mind and this is essential to sharpen the vision of the game. Practicing daily will allow you to quickly recognize the specific positions of the pieces which favor combinations and it will develop your strategist instincts. The "tactics practice" module takes place in a fun-filled world. The "mix" mode will work your memory. And the "battle" mode will offer you an opportunity to compete against opponents. A great way to spice up the exercises! Is this tactics practice module likely to change? As for any new service the answer is yes. We will listen to your comments and suggestions and will do the improvements and modifications if necessary. This could particularly be the case related to the calculation mode of Elo for which taking a step back is necessary. Same for the proposed statistics. With regard to puzzles, the database will grow over time. How is Elo calculated and when does it change? Two Elos are calculated. One is "tactic" Elo and the other is "battle" Elo. They are calculated by using the Glicko system. Tactic Elo: A tactic Elo is calculated after each exercise but only during the first round. If you redo the same exercise later on, it will not result in a change of Elo. This calculation is done in practice mode and also in mix mode or battle mode. Each puzzle has been evaluated by us and has received an Elo. Just as how the Elo of a player is calculated against a real opponent, we evaluate the Elo of a player compared to the difficulty of the puzzle. A win is calculated if the puzzle is solved within the reference time (maximum 30 seconds per move) and if no errors are committed. A draw is calculated if the puzzle is solved within the reference time and that only one error is committed. A defeat is calculated in all other cases (reference time exceeded and/or the number of errors are greater than 1). Battle Elo: It is calculated after each battle, after comparing the scores of the two players. The highest score is awarded the win and the other the defeat. In case of equal scores, it is a draw. In addition to Elo calculation, why is a score at the end of each puzzle calculated? A score is calculated after each puzzle and a total is calculated at the end of each series. The score ranges from 0 to 100000 points for each puzzle. It helps to evaluate your performance more accurately than a simple Elo calculation. As the resolution time and the number of errors are taken into account, your score allows you to assess your progress, especially when you repeat the same series several times. In this case, when your score improves, you are notified at the end of each puzzle. The practice mode is the standard round. Each series is classified in a tree of sections. You choose the section that you want to work with, the type of exercise that suits you and its difficulty. Catogories: each category has an icon that sometimes describes the number of moves (x1, x2, x3, ...) and also the difficulty of the puzzles (shown with a green face (easy), orange (average), red (difficult). See the below example from the category of easy puzzles to solve in 3 moves. "Mix mode" is a mode with random generation of puzzles. When generating a "mix", 10 puzzles are randomly selected from the entire database of puzzles while considering your account settings (Elo strength, already completed puzzles only, unsolved puzzles only, choice of section, etc.). A "battle" is a game between two players. With a send/receive system of challenges to connect the players, they compete on 10 randomly selected puzzles across the entire database. This selection is made considering the strength of the two players. The two players do not need to be available on the site at the same time to play the "battle". They take turns and the end result will be displayed when the two players have completed the round. A "battle" Elo is calculated following each "battle" by comparing the scores of the two players to decide if it is a win, defeat, or a draw. Competitions will be held at regular intervals on the site. Dates of upcoming tournaments will be posted in advance on the home page of the practice module. Competitions are held on the day and the specific timeand have a limited time duration between 10 and 30 minutes. It is necessary to register in advance. Once the tournament has started it will be too late. At the end of the competition a ranking is given and the first 3 places are highlighted in the player statistics. Unlike "battles" which use puzzles from the practice database, tournaments are played with new puzzles. Can we play on a tablet or a mobile? Indeed, the game interface is designed to fit mobile and tablet screens. What if I cannot find a solution to a puzzle? The "Quit" button at the bottom of the page and for mobile mode the icon allows you to quit the puzzle and move on to the next. If a puzzle is completed for the first time, a loss of Elo is calculated in case if abandoned. How to read the analysis report ? Every move you play results in an assessment of the position by the analysis engine, which then gives it a score. Even though it’s difficult to give every score a specific meaning (1.00 is the value of a pawn), here is an rough meaning of the numeric scores depending on their value. The graph shows the development of the white and black advantages during the game. Peaks indicate mistakes on both sides. You can click the graph to replay the corresponding moves on the board. The statistics of the game give a quick overview of the performance of each side. The variant area (displayed whenever a move is replayed on the board) gives, in order, the 3 best moves found by the analysis engine and their corresponding variants. Note: the display of variants is limited to 6 half-moves, but the downloadable PGN contains more detailed variants. Example: here, the white side played 22.Nxa6. They would have done better to play with 22.Qf3, or 22.Nxe6, or even 22.Qa4. You can replay a variant by directly clicking the moves, but also by using the keyboard. Icons on the left of this are indicate the keyboard shortcuts to interact with the variants. You can navigate within the same variant of one move to another using the right and left arrows on the keyboard the same way as you navigate in the game. The PGN file containing the analyses can be downloaded to be replayed in any PGN reader. We utilize lots of resources to generate relevant analyses. The analysis is spread out over several high-powered computers, and every move is analyzed for 5 seconds at full power. As such, processing a game with 40 moves (80 half-moves) only takes about 10 seconds. We also use one of the most powerful engines on the market: Stockfish 7. Of course, from one analysis engine to another or from one computer to another, the results may vary, but we have made technical choices so that the analysis will fulfill its goal: to give the trends in the game, and the strengths and weaknesses of both sides. Is there a limit to using the analysis service? There’s no limit to the number of games you can analyze. You can analyze as many games as you want, either your own or from other players, using the games observed in the playing area, or from the game history available on the website. However, in order to distribute resources fairly among all member, a priority system is used. Players who request game analyses for the first time that day have priority over those who have already requested several analyses. This priority is then readjusted. Players in their trial period are limited to analyzing 3 games per day. Still, we have allocated sufficient resources so that the wait time is as short as possible. Find the answers here to the most frequent questions.